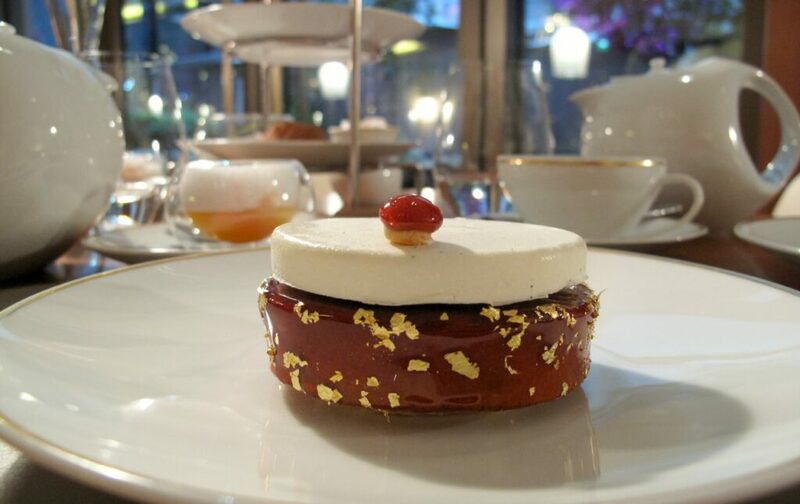 Welcome back to our new teatime series where we’re testing out the best afternoon teas at the top Parisian Palace hotels. Whether it’s a typically all-sweet French occasion or a slightly British-inspired teatime with savouries, you’ll surely be tempted to book a table at one of our favourite 5-star hotels for your next Paris visit, as each have their own sumptuous specialities. Following our last distinctly French Teatime at the Ritz, you’ll find a more contemporary atmosphere just around the corner at the Mandarin Oriental Hotel on the legendary Rue Saint Honoré. Teatimers are welcomed by relaxed, friendly staff at the entrance to the Camelia Cake Shop, showcasing the latest sweet – and savoury – stars by new pastry chef, David Landriot. Teatimes here change according to season or particular events. Last year they produced an incredible 3-boxed Clown Bento extravaganza, in honour of the film Chocolat the Clown, as the hotel’s location sits on what was previously the most popular Circus in central Paris. 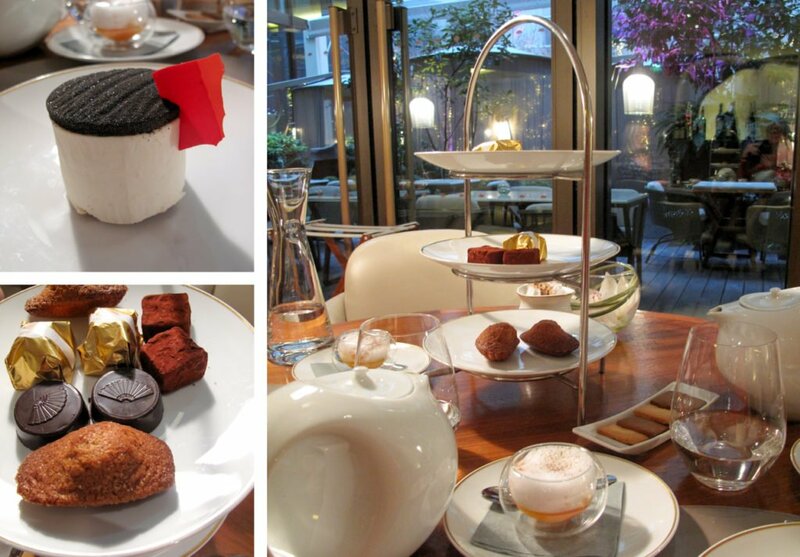 We were thrilled to be invited to taste their latest “Winter Teatime,” which is available until the end of March. Starting with one of their Jing teas served in Alice-like oversized pots, we particularly loved the little glass verrine of refreshing Clementine foam that cleansed the palate before our choice of pastry from the menu. As Rue Saint-Honoré is also the birthplace of the legendary Saint-Honoré pastry, the highlight is Chef Landriot’s re-creation of it. Named after the patron saint of bakers and invented by chef Chiboust in 1847 from his bakery on Rue Saint-Honoré, I’m personally hoping they come up with a Saint-Honoré teatime next! It’s still traditionally composed of puff pastry, choux/profiterole pastry, vanilla cream, salted butter caramel and whipped (or Chiboust) cream, but given a contemporary sleeker look with the caramel on the sides, glittering with edible gold. See a picture of it at the top of this blog post. If it’s gluten-free you’re after, try the slightly lighter Oriental: a chocolate French butter cookie, flourless sponge cake, light vanilla and Sichuan pepper mousse and Madong chocolate cream. Since our tasting, the Winter Teatime now includes sandwiches and scones. If you can’t finish everything that’s winking at you from the cake stand, such as the candied chestnuts, madeleines and chocolates, then don’t feel shy to ask to take them home. I look forward to returning one weekend, as I hear that teatimes will soon be animated with a pianist! PREVIOUS: All the Incredible Things to See & Do Near Our Provence Villa! Posted on Friday, February 24th, 2017 at 4:00 pm in Food & Drink. You can follow any responses to this entry through the RSS 2.0 feed. You can leave a response, or trackback from your own site. Teatime at the Ritz – The Sumptuous Salon Proust Sweet & Savory Champagne Teatime at Le Meurice Ice Skating in Paris at the Hôtel de Ville 100% Vegan Afternoon Tea at the Shangri-La!